Full Base Block - 24" 48 x 24 x 16" H 5.33 sq.ft. 1,457 lbs. Full Base Block - 39" 48 x 39 x 16" H 5.33 sq.ft. 2,201 lbs. Full Base Block - 45" 48 x 45 x 16" H 5.33 sq.ft. 2,491 lbs. Full Base Block - 60" 48 x 60 x 16" H 5.33 sq.ft. 3,115 lbs. Full Base Block - 66" 48 x 66 x 16" H 5.33 sq.ft. Full Base Block - 72" 48 x 72 x 16" H 5.33 sq.ft. Full Base Block - 78" 48 x 78 x 16" H 5.33 sq.ft. Full Base Block - 84" 48 x 84 x 16" H 5.33 sq.ft. 4,088 lbs. Full Top Block - 24" 48 x 24 x 16" H 5.33 sq.ft. 971 lbs. Regular Corner 48 x 24 x 16" H 5.33 sq.ft. 1,401 lbs. Corner Top 48 x 24 x 16" H 5.33 sq.ft. 1,103 lbs. Half Block 24" 48 x 24 x 16" H 5.33 sq.ft. Half Block 36" 48 x 36 x 16" H 5.33 sq.ft. Capstone 48 x 26 x 6.5" H 2.16 sq.ft. 551 lbs. Additional blocks: Full Fence or Full High Cap Block End, Full Fence or Full High Cap Block Top Texture, Half Fence or High Cap Block End. 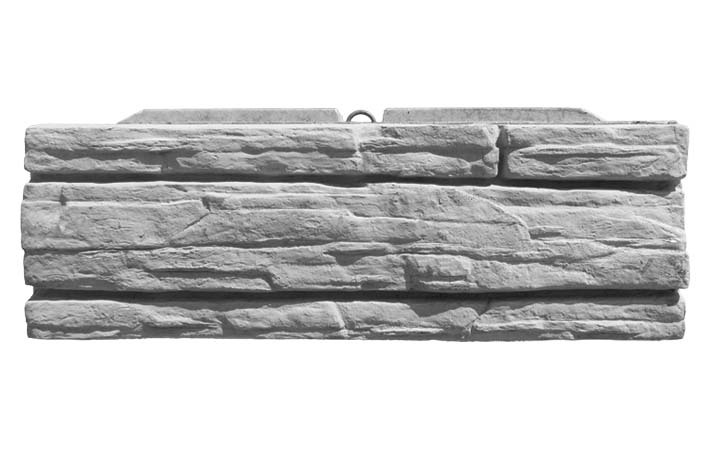 Weathered Edge blocks: Full 24", Regular Corner, Corner Top, Half Block (24" or 39" deep), Fence or Full High Cap Block End. Notes: Special order for additional textures. Available in IA and WI only. Face and color options are shown below. Recon wall color is applied after construction is complete.